Harvard University Press, 9780674737587, 336pp. 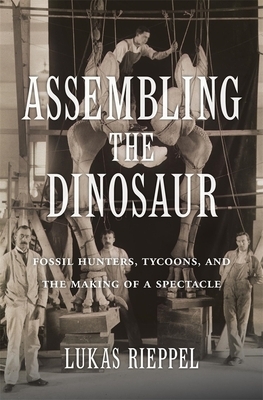 A lively account of how dinosaurs became a symbol of American power and prosperity and gripped the popular imagination during the Gilded Age, when their fossil remains were collected and displayed in museums financed by North America's wealthiest business tycoons. Although dinosaur fossils were first found in England, a series of dramatic discoveries during the late 1800s turned North America into a world center for vertebrate paleontology. At the same time, the United States emerged as the world's largest industrial economy, and creatures like Tyrannosaurus, Brontosaurus, and Triceratops became emblems of American capitalism. Large, fierce, and spectacular, American dinosaurs dominated the popular imagination, making front-page headlines and appearing in feature films. Assembling the Dinosaur follows dinosaur fossils from the field to the museum and into the commercial culture of North America's Gilded Age. Business tycoons like Andrew Carnegie and J. P. Morgan made common cause with vertebrate paleontologists to capitalize on the widespread appeal of dinosaurs, using them to project American exceptionalism back into prehistory. Learning from the show-stopping techniques of P. T. Barnum, museums exhibited dinosaurs to attract, entertain, and educate the public. By assembling the skeletons of dinosaurs into eye-catching displays, wealthy industrialists sought to cement their own reputations as generous benefactors of science, showing that modern capitalism could produce public goods in addition to profits. Behind the scenes, museums adopted corporate management practices to control the movement of dinosaur bones, restricting their circulation to influence their meaning and value in popular culture. Tracing the entwined relationship of dinosaurs, capitalism, and culture during the Gilded Age, Lukas Rieppel reveals the outsized role these giant reptiles played during one of the most consequential periods in American history.